2015 was another year of mixed fortunes for the music industry, with Nordic markets showing positive signs (again) while some bigger markets struggle. It is in this context that French music industry trade body SNEP announced that the French recorded music market registered a whopping 7% decline in 2015, which followed hot on the heels of another 7% decline in 2014. The net result is that France’s recorded music market is now 67% smaller than it was in 2000. To give an extra sense of perspective, if the French market had declined by the same €32 million in 2001 that it did in 2015, the market would have reduced by just 2%. Streaming revenues were up an impressive 47% but physical sales fell by 16% and downloads by a staggering 21%. Streaming is an increasingly important part of the mix but it is still a minority player, increasing its market share from 16% in 2014 to 24% in 2015. Even though the download collapse was seismic, the lost revenue (€12.7 million) was less than half the amount that streaming grew by (€33.2). So however much streaming may be cannibalising downloads (and it is) it is adding more than it is taking, in France anyway. But we are not just experiencing one format transition, the CD is dying off too. So when you add the decline in download sales and physical sales together, the total (€64.3 million) is nearly double what streaming added. The recorded music business is switching from a sales model to an access model but the revenue transition is lagging the behavioural shift. Perhaps most perplexing though was the fact that ad supported streaming revenue, for both audio and video, declined by 8%. As regular readers will know, I have long advocated that free streaming should move towards a Pandora like model and away from full on demand. Now the revenue story is building to support this case. Back in October we published our MIDiA Research music forecasts report ‘Global Music Forecasts 2015-2020: Declining Legacy Formats Cancel Out Streaming Growth’ (from which the above chart is taken and which you can buy here). We predicted that the continued decline of legacy formats (i.e. the download and the CD) would undo all the positive growth work of streaming resulting in market stagnation / market decline. As the French experience shows us, this reality is already coming to pass. Taylor Swift made big waves over the weekend with her open letter to Apple protesting it should pay for its 3 month free trial. Her voice was just one more following protests from across the indie community of which Swift and her label are both members. But it turned out that her voice was the loudest and Apple’s Eddy Cue swiftly announced a u-turn on Apple’s free trial pay outs. This is just one more twist in the much bigger streaming story but it does highlight some interesting dynamics, not least of which is how Swift’s worldview differs from many of her contemporaries. As paradoxical as it may sound for such a digitally savvy artist as Taylor Swift, she is in fact from the old school when it comes to recorded music. Swift started her career so early – she signed her first label deal when she was just 14 years old – that she is effectively further into her recording career than most successful 30 something artists. So she is an album era artist who, with her label Big Machine, managed to build a long-standing successful music sales career. Streaming, with all of its substitutive impact on sales, does not fit well with the Swift / Big Machine model. In many respects Swift’s recorded music worldview has more in common with artists of Coldplay’s generation than it does hers. The contrast with successful contemporary mainstream pop artists is stark. The take of Ed Sheeran (who is just one year younger than Swift) on the role of recorded music is “I’m in the music industry to play live. That’s why I make records” while Calvin Harris (currently romantically linked with Swift) is famously a co-owner of streaming platform TIDAL. Both of those artists have been supremely successful on Spotify and neither has a decade of platinum selling albums behind them. For them, streaming is simply how it is and they are learning how to make that work. None of this is to belittle the hugely disruptive impact of going from a sales model which guaranteed up front revenue to an access model where revenue is fractionalised over many years. In the sales era a purchased album generated $10 of gross revenue whether it was listened to once or a thousand times. In a streaming service an album that is listened to once generates $0.10 and only reaches $10 when listened to a hundred times. If you are a superstar artist you can probably swallow the near term pain because a) your streaming volumes are in the billions so the pennies add up and b) you make the majority of your money from playing live. If you are a smaller artist the outlook is bleaker for getting through the transition period i.e. until streaming services are big enough to ensure a high tide rises all boats. Interestingly for Swift, for all her sales success, live is also where she makes her money. She ranks as the highest earning artist on Billboard’s top earners list with $39 million but $30 million of that came from live. She explains in her post that “[I] can support myself, my band, crew, and entire management team by playing live shows” and that she is raising her voice for “the new artist or band that has just released their first single”. This may well be the case but she is also very much doing this for her label Big Machine Records (which doesn’t get to benefit in any truly meaningful way from Swift’s live revenue). Swift’s rise to prominence and continued success is intrinsically linked to that of her label Big Machine Records and it is fully understandable why she has been so perfectly aligned with Big Machine’s stance on streaming. But it is a position nonetheless. None of this though detracts from the core issue at stake here, namely Apple not paying for a 3 month free trial. Apple is in the business of selling music in order to sell hardware. Apple’s primary concern is not what % of iTunes sales become substituted by free trials (near term) and subscriptions (long term) but instead how it helps them gain and retain device buyers. Swift, Big Machine and the rest have very good reason for being very cautious with Apple’s streaming strategy. Apple is the leading source of digital music sales and accounted for approximately $2.8 billion of music sales revenue in 2014, or 40% of all digital music revenue. If Spotify messes up a free trial the labels risk slowing the rate of new streaming revenue growth. If Apple messes it up the money that keeps the lights on is at risk. Apple doesn’t need any financial assistance in launching Apple Music (it does after all have $178 billion in cash reserves) but it does need careful attention from labels and artists alike to ensure it gets the strategy right. Whatever the outcome though the streaming transition is an inevitability and Taylor Swift is no more able to hold it back than King Canute was able to hold back the tide. 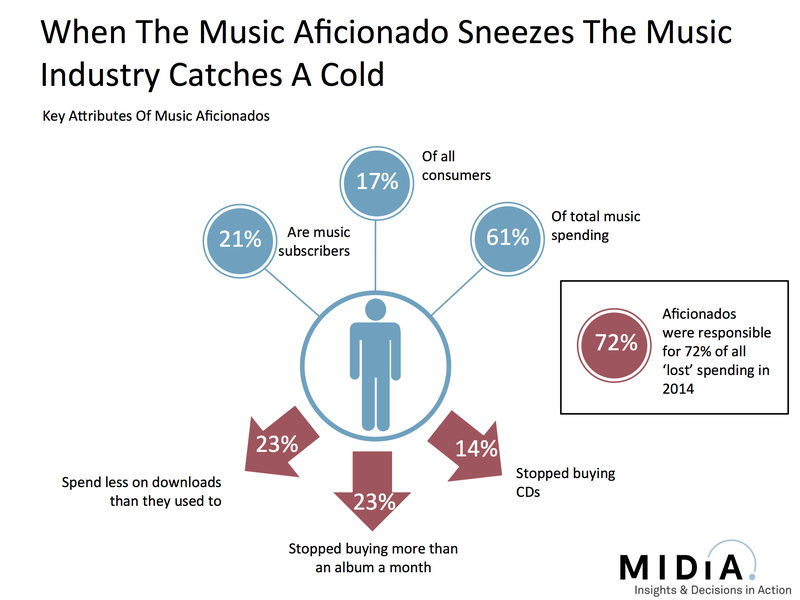 In total the Aficionados accounted for 76% of the lost CD and download revenue in 2014. So what’s going on? Why are the super fans jumping ship? Well first of all, they aren’t. This is a transition process. They are shifting their spending towards subscriptions. For some of them this will mean spending less (especially the 23% that stopped buying more than an album a month and are now spending $9.99 instead of $20 or $30). For others it will be an increase in spending. At a macro level though, lost download and CD spending accounted for a $617 million decline while streaming growth accounted for a $351 million gain, which means that there was a net loss of $265 million. Because the music industry has largely stabilized after years of dramatic decline, it only takes relatively minor fluctuations one way or the other to determine whether a market grows or shrinks. This is why both the Aficionado needs more attention now than ever and also why the Passive Massive needs engaging at scale. Aficionados have been taken for granted for too long and are now being migrated away from products without a spend ceiling (albums) to a product with a fixed ARPU cap (9.99 subscriptions). When the Aficionados sneeze the music industry gets a cold. It is time for a cure. I recently keynoted the annual Future Music Forum in Barcelona. These are some highlights of the keynote. If you would like the full slide deck please email me at mark AT midia research DOT COM. Streaming is turning years of music business accepted wisdom on its head but did not arrive unannounced, it is just one chapter in the evolution of digital music. 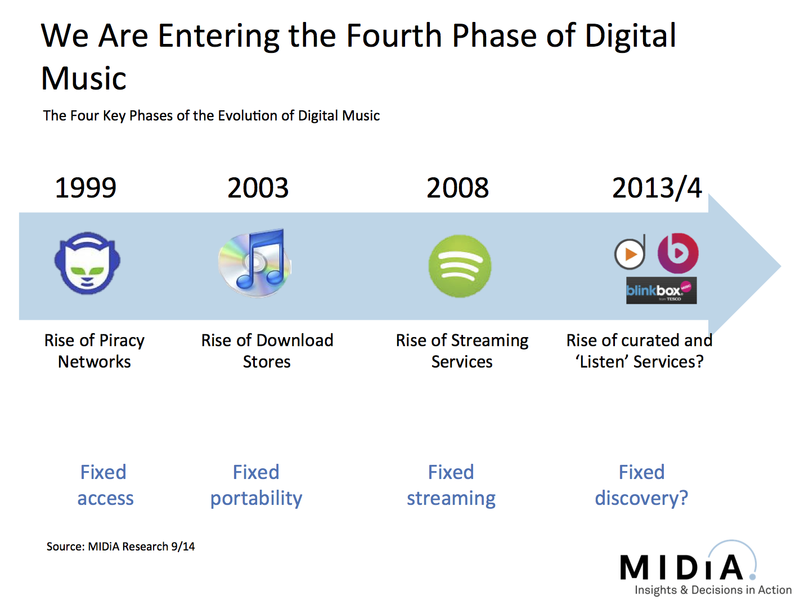 Each of the four phases of digital music have been shaped by technologies that solved problems. Now we are entering the fourth phase, bringing meaning to the 30 million tracks Spotify et al gave us access to. This might look like a simple honing of the model but it is every bit as important as the previous three stages. 30 million tracks is a meaningless quantity of music. It would take three lifetimes to listen to every track once. There is so much choice that there is effectively no choice at all. This is the Tyranny of Choice. 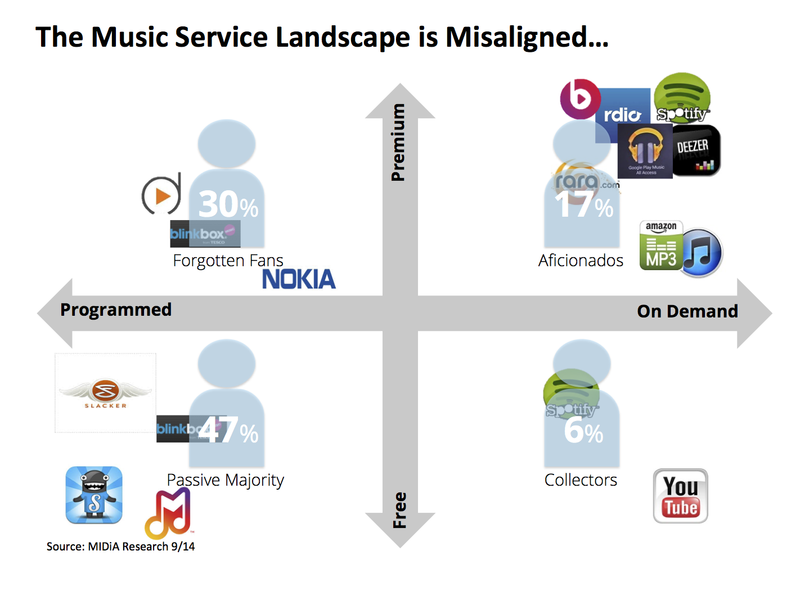 But the for all the evolution, today’s digital music marketplace is an unbalanced one. We have more than 500 music services across the globe but too many of them are chasing after the same customers with weakly differentiated offerings. This wouldn’t matter so much is if the competition was focused on where the consumer scale is, but this is anything but the case. The majority of paid music services are targeting the engaged, high spending Music Aficionados who represent just 17% of all consumers. 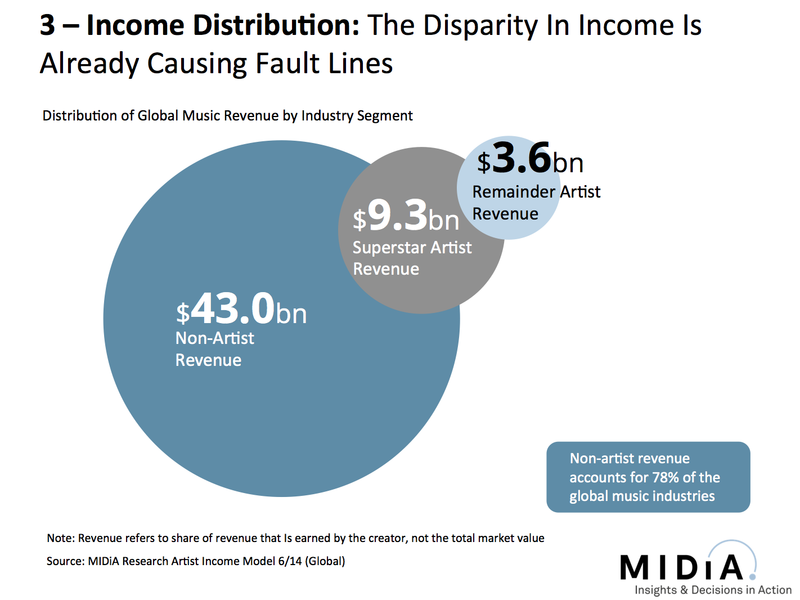 The consequences of the imbalance in digital music strategy are also easy to see in total revenues. 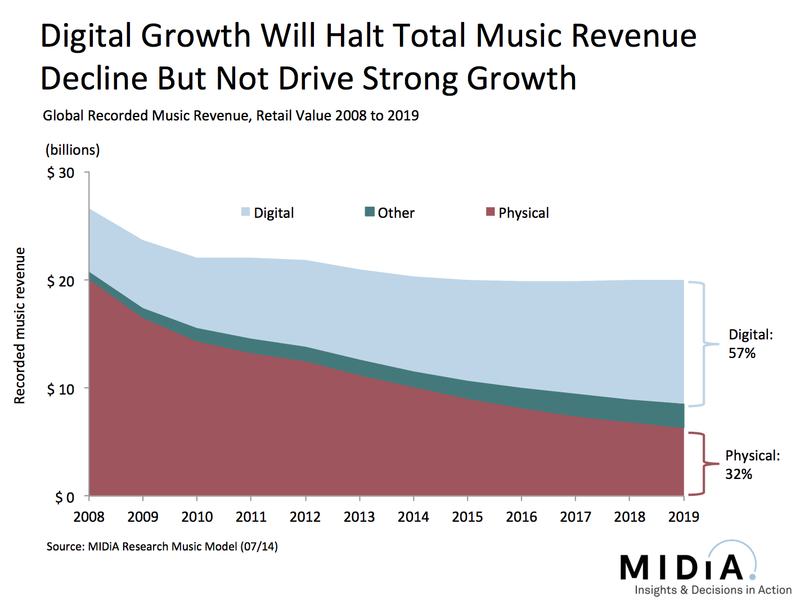 The last decade has been one of persistent decline in recorded music revenue and by 2018 the most likely scenario is one of stabilization rather than growth. This is because of a) the CD and b) the download. No one has taken the demise of the CD seriously enough. It still accounts for more than half of global revenue and more than three quarters of revenue in two of the world’s biggest music markets. Yet far too many CD buyers are being left to simply stop buying entirely because they see no natural entry point into the digital services market. No one appears to be putting up a serious fight for them. Meanwhile the streaming services that have been chasing those same aficionados that Apple engaged are now busy turning that download spending into streaming spending, which ends up being, at best, revenue transition rather than growth. Consequently CDs and downloads will end up declining at almost the same rate over the next five years. Nonetheless the imbalance remains. Part of the reason we got into this state of affairs is the music industry’s obsession with revenue metrics: chart positions, market share and ARPU. Compare and contrast with the TV industry’s focus on audiences. 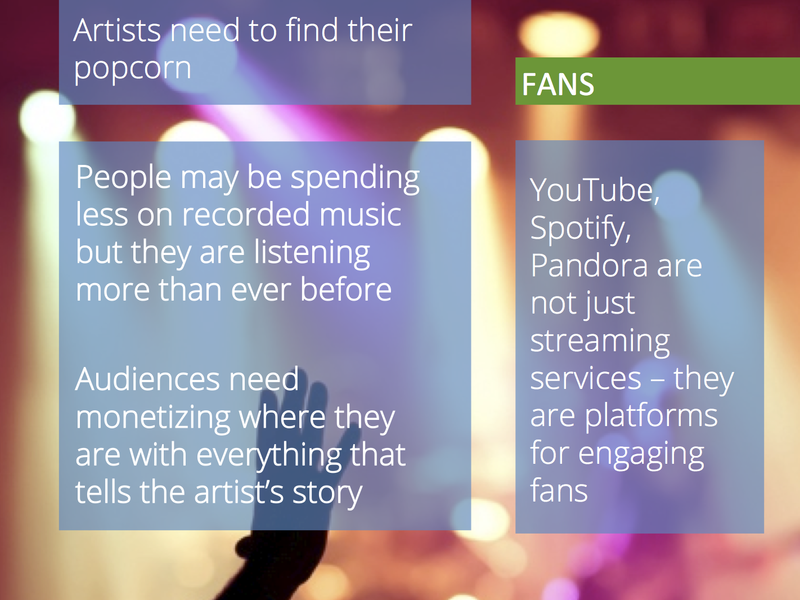 It is time for the music industry to start thinking in audience terms too. When we do so we see a very different picture. 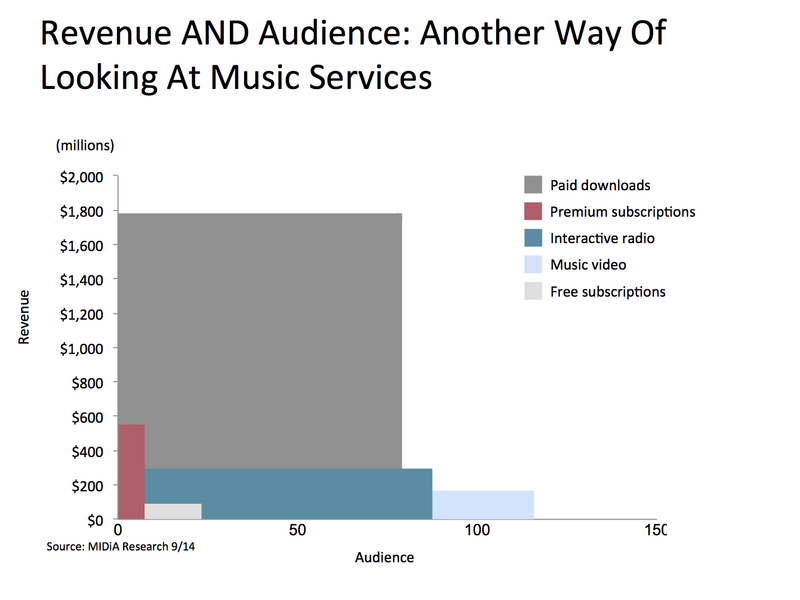 Here we have the US digital music market plotted by revenue and by audience size. Subscriptions pack a big revenue punch but reach only a tiny segment of the market while YouTube has vast reach but delivers remarkably little in terms of direct revenue. Meanwhile downloads, for all their doomed future, are still by far the best combination of scale and revenue. The issue of free services stealing the oxygen from paid ones is a perennial one and is effectively a digital rerun of the never-to-be-resolved radio driving or reducing music sales debate. But it has far more impact in digital. With services like YouTube and Pandora the discovery journey is indistinguishable from the consumption destination. When they don’t lead to sales can they really be called discovery anymore? Free is of course the language of the web. The contagion of free is legion. And free is where the audience growth is. This is the circle the music industry must square. Consumer behaviour. The most important consumer behaviour trends are not the steady transition of the Aficionados or even the Forgotten Fans but of the next generation of music consumers, the Digital Natives. 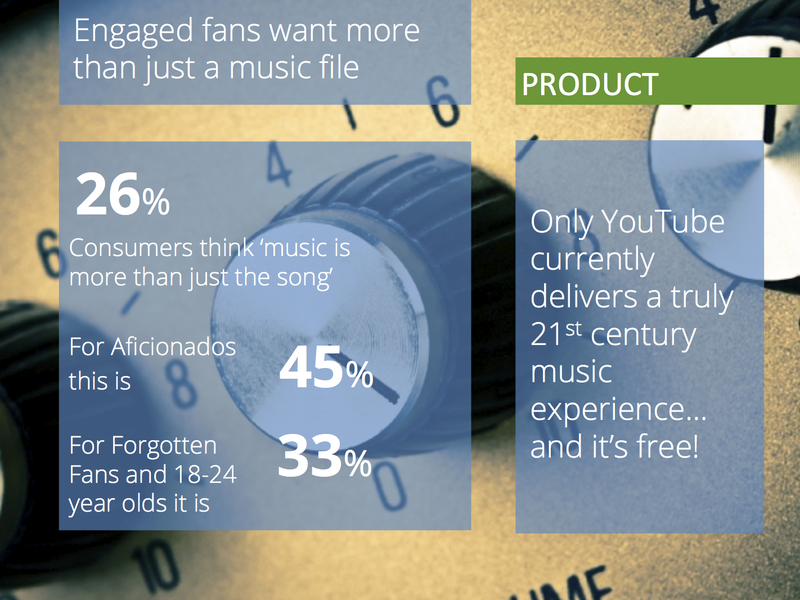 Free and mobile are the two defining elements of their music behaviour. Of course younger people always have less disposable income, but there is a very real chance that we are beginning to see demographic trends locking in as cohort trends that will stay with these consumers as they age. For a generation weaned on free, the more free you give them, the more they will crave it. Whatever course is plotted, success will depend upon deeply understanding the needs of Digital Natives and not simply trying to shoe horn them into the products we have now that are built for the older transition generation. 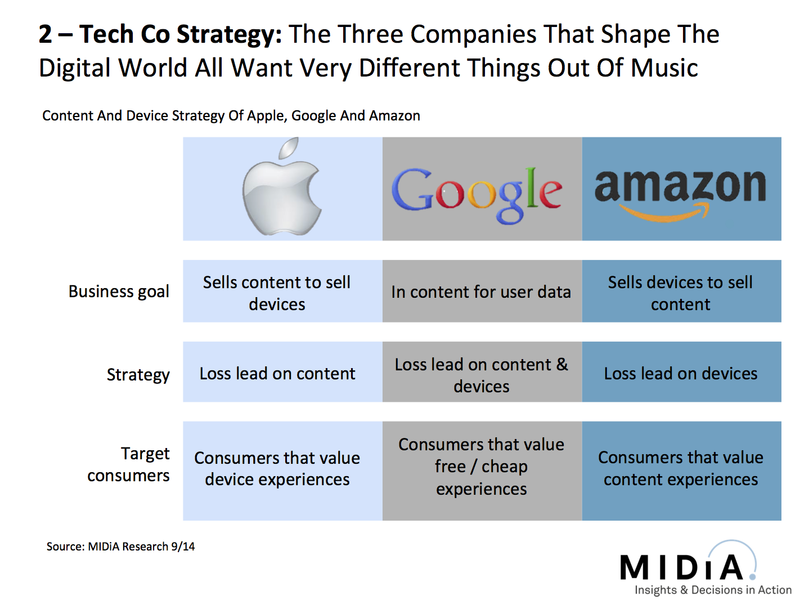 Technology companies: Apple, Amazon and Google each in their own ways dominate digital music. But most importantly they all want very different things from it. For each of them music is a means to an end. All are willing to some degree to loss lead on music to achieve ulterior business objectives. All of which is great for labels and publishers as they get their royalties, advances and equity stakes. But for the pure play start up it means competing on an uneven footing with giant companies who don’t even need music to generate a revenue return for them. Revenue distribution: Artists and songwriters found their voices in recent years. Partly because of the rise in social media but also because so many are now paying much more attention to the business side of their careers. The fact they are watching download dollars being replaced by streaming cents only intensifies matters, as does the fact that the top 1% of creators get a disproportionately large share of revenue. It has always been thus but the signs are that the disparity is becoming even more pronounced in the streaming age, with the effects felt all the more keenly because unless you have vast scale streaming can too easily look like chicken feed to an artist compared to download income. But artist and songwriter discontent alone is not going to change the world. Their voices are just not powerful enough, nor do most fans care enough. Also labels and publishers remain the most viable route to market for most artists. Matters aren’t helped by the fact that artists who demand an audit of their accounts to work out where their streaming revenue has gone swiftly accept their label’s hefty silence payment and the accompanying NDA. Artist discontent while not decisive in impact is beginning to apply important pressure to the supply end of the music business. So those are the three big challenges, now here are three sets of solutions. And I should warn you in advance that I am going to use the P word. Yes, ‘Product’. I get why product sounds like an ugly word. It’s a term you use for baked beans, for fridges for phones. Not a cultural creation like music right? True enough, when we’re talking about the song itself, or the performance of it, product is irrelevant. But as soon as we’re talking about trying to make money out of it as a CD, download, stream or however, then we’re firmly in the territory of product. It is both naïve and archaic to think otherwise. When artists got megabucks advances and never had to worry about the sustainability of their careers and everything revolved around the simplicity of CD sales you could perhaps be forgiven for turning a blind eye. But now there is no excuse. So with that little diatribe out of the way, on to the first solution. Music product: The harsh reality is that music as a product has hardly evolved in the digital realm. A lot has been done around retailer and business model innovation, but the underlying product is the same static audio file that we found in the CD. Meanwhile the devices we are spending every growing shares of our media consumption have high definition touch screens, graphics accelerators, accelerometers…audio hardly scratches the surface of what tablets and smartphones do. Music is always going to be about the song, but it is also about the artist and their story. That’s what a quarter of consumers think, and 45% of aficionados and a third of digital natives. Video, lyrics, photos, reviews, interviews, acoustic sets, art, these are all ways in which the artist can tell their story and they all need to be part of the product. Most of this stuff is already created by labels, artists and managers but it is labelled marketing. Putting this together into a curated, context aware whole is what will constitute a 21st century music product. Fans: Artists and fans are closer than ever but this journey is only getting going and artists need to get smarter about how to monetize their fan bases. Artists need to find their popcorn. What do I mean by this? Well when the cinema industry started out it was a loss making business. To try to fix this cinemas started by experimenting with the product, putting on double bills but that wasn’t enough. Then came innovation in the format by adding sound. Then the experience itself by co-opting the new technology of air conditioning from the meat packing industry. Still no profit. Finally cinemas found the solution: popcorn. With a 97% operating margin, popcorn along with soda and sweets quickly became how cinemas become profitable entities. Artists need to find their popcorn. To find out what other value they can deliver their fans to subsidize releasing music. It’s what newspapers are doing with wine clubs and travel clubs, and in some instances even with Spotify bundles! Labels: Finally we have agencies or what you might call labels, but I’m going to call them agencies, because that is what they need to become. The label model is already going under dramatic transformation with the advent of label services companies like Kobalt and Essential and of fan funding platforms like Pledge and Kick Starter. 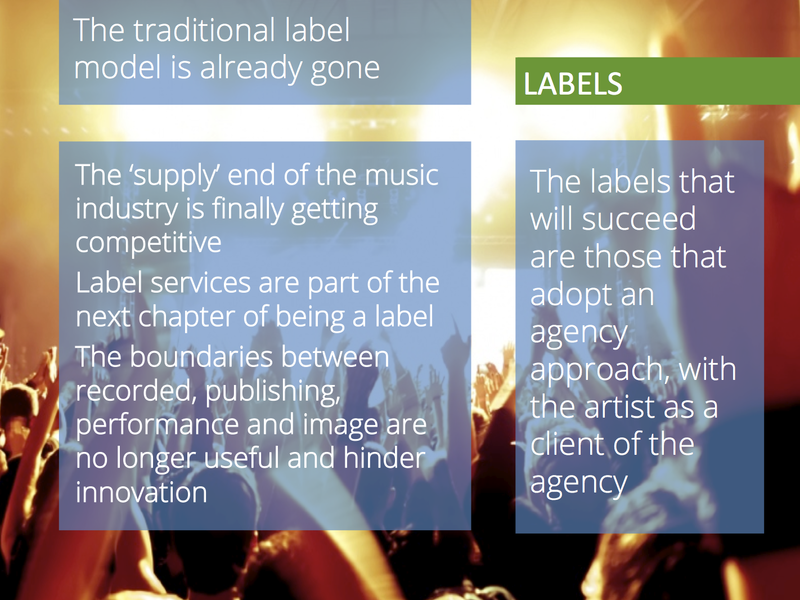 All of these are parts of the story of the 21st century label, where the relationship between label and artist is progressively transformed from contracted employee to that of an agency-client model. Labels that follow this model will be the success stories. And these labels will also have to stop thinking within the old world constraints of what constitutes the work of a label versus a publisher versus a creative agency versus a dev company. In the multimedia digital era a 21st century labels needs to do all of this and be able to work in partnership with the creator to exploit all those rights by having them together under one roof. And finally, the grand unifying concept to pull all this together: experience. 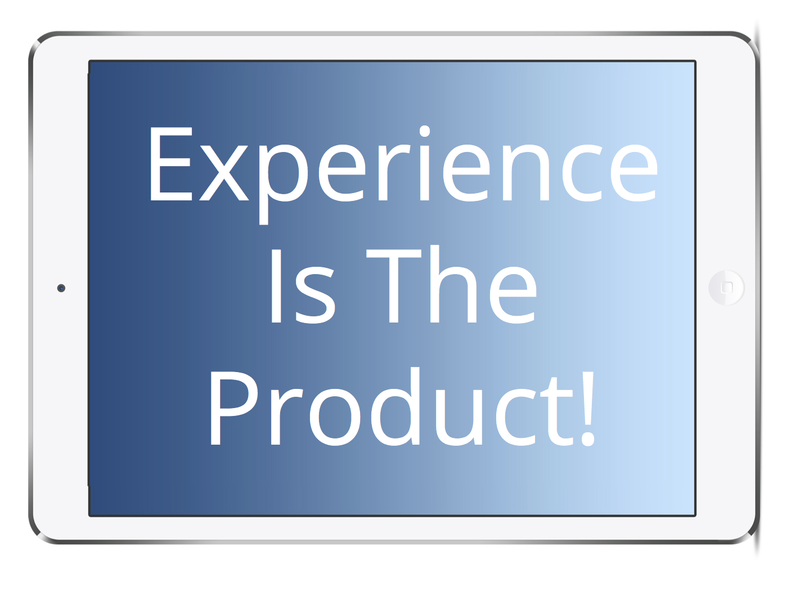 Experience is the product. The internet did away with content scarcity. Now the challenge that must be met is to create scarce, sought after experiences that give people reasons to spend money on the artists and music they love. The Dutch music industry trade body the NVPI has announced that recorded music revenues were up by 1.9% in the first half of 2013. This follows first half rises for Norway (17%), Sweden (12%) and Germany (1.5%) which in turns comes on the heels of full year growth in 2012 for markets such as Brazil, Sweden and Norway (all markets with strong subscriptions and ad supported sectors). This is undoubtedly positive news and indicative of the proverbial corner being turned. However it is still too early to draw definitive conclusions about the impact of streaming on music revenue (and let’s stop calling it ‘sales’, a tag that hardly fits on-demand subscriptions). Music revenues have been in decline for so long that sooner or later the bottom has to be reached, else the market would diminish into obscurity. We are now somewhere close to that bottom but we need to be careful not to read too much into 1st half sales. Music revenue is heavily concentrated into the last quarter of the year due to festive period gifting. But gifting is becoming increasingly eaten away at by digital for many reasons, not least of which is that gifting an iTunes voucher just isn’t the same as actually giving an album. So if digital is able to sustain growth across growth markets for a second successive year then we can start talking about the sustained revenue growth potential of streaming. Even if that growth is sustained though, another speed bump is on its way: the post-CD revenue collapse. The CD is still by far the world’s biggest music revenue source. If you strip out the US and UK, digital accounted for just one qyarter of global music sales in 2012. Viewing the music world through the Anglo-American lens can give a distorted view of things. In Japan, the world’s second biggest music market, physical accounts for 80% of revenue, in Germany, the fourth largest, it is 75%. Currently the trend in most markets is that many CD buyers are simply falling out of the habit of buying music rather than going digital. If that trend continues for a sizeable chunk of the music buyers that currently account for three quarters of non-US and UK music spend, then a big dip in revenues should be anticipated. The fate of the CD is of course largely out of the hands of streaming services, but is nonetheless highly correlated. Streaming has taken root most quickly in the markets where the CD has already hit rock bottom. There are clear-cut cases of streaming helping tip these markets into growth but there are also plenty of markets with strong streaming where total market growth has not yet arrived (see figure). In some instances the scale of the decline of the CD market is just too big for digital to do anything about. What is clear from this sample of markets though is that there is a large concentration of low streaming / low growth markets and very few low streaming / high growth markets. 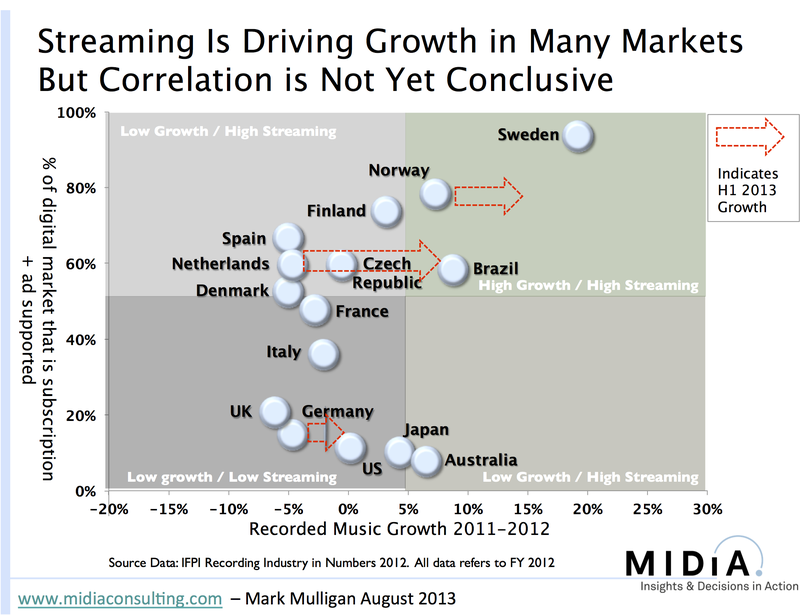 Where streaming has a low market share, revenue growth is usually negative. This does not necessarily indicate cause and effect but the correlation is nonetheless fairly compelling. So while it is too early to say that streaming is saving music revenues, we are seeing the first signs that in markets with the right conditions, it can be enough to tip the balance. Psy’s ‘Gangnam Style’ might have catapulted the South Korean music market into the global consciousness but to industry observers like myself it has long been a market of particular interest. 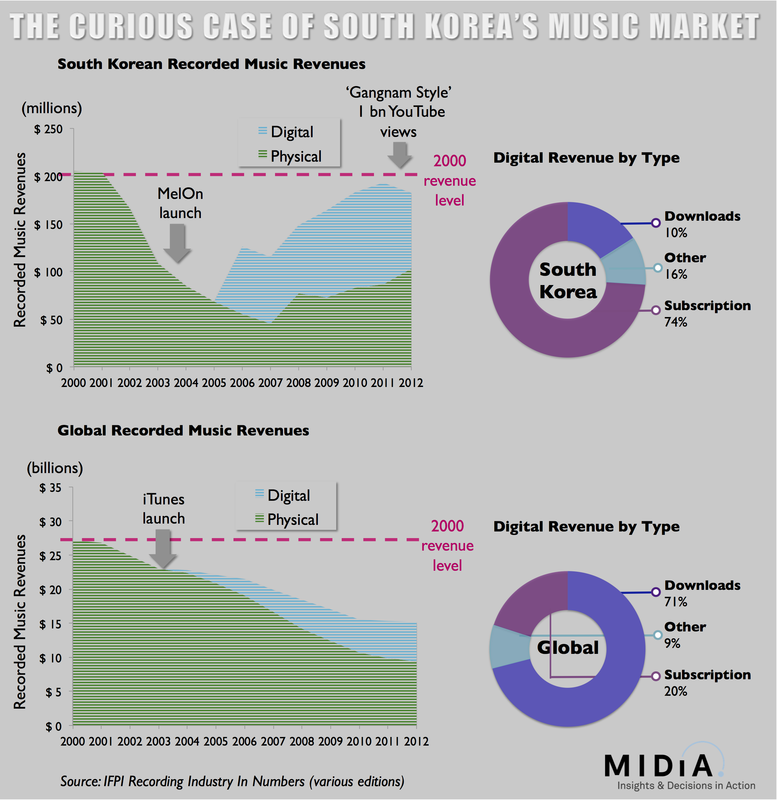 Being the first major music market to pass the 50% digital mark – in 2006 – South Korea has been held up both as a digital trailblazer and as a canary in the mine for the global music industry. Strong growth over recent years hinted at a brighter international future, but just as ‘Gangnam Style’ was propelling South Korean music to unprecedented global heights the South Korea music market went back into decline. According to the IFPI’s invaluable Recording Industry in Numbers, South Korean recorded music revenues declined by 5% in 2012, breaking a run of four years of successive growth. But unlike the global market, it wasn’t the CD that was to blame for the fall but digital. Physical revenue grew by 19%, the third successive year of growth, while digital actually declined by 25%, dragging the entire market down with it. The mirror opposite of the global music market where 7% digital growth wasn’t enough to prevent a 5% physical decline drag down total revenues by 1%. Piracy: piracy is of course just one contributory factor to the downturn in music revenues (albeit a crucial one) but the effect was felt particularly keenly in South Korea. The South Korean government was an ardent supporter of the telco sector in the 1990’s and early 2000’s, resulting in some of the best high-speed broadband infrastructure on the planet. However this support came at the cost of the government effectively turning a blind eye to rights holder concerns. Unsurprisingly piracy boomed with file sharers and networks alike operating with near impunity. South Korea became a perennial fixture on the US Trade Representative’s piracy watch list but finally the government started to redress the balance from 2007/8, introducing new copyright legislation, including a graduated response initiative in 2009. And since 2007 the market has grown by an impressive 58%, nearly reaching 2000 levels by 2011. But just how much of this can be attributed to government action is open to question as music revenues had already grown by 84% in 2006 alone. (The rate of growth in 2006 is however skewed by the fact digital numbers were not reported in prior years). Subscriptions: the central force in South Korea’s digital market is SK Telecom’s MelOn subscription service which was the first in the world to amass a million paying subscribers and now numbers 2 million paying users and 18 million registered users. MelOn was competitively priced (less than $3.00) and included mobile downloads from the start, enabling it to have immediate impact. South Korean subscription revenues more than doubled between 2009 and 2012. Rights holders have not been entirely happy though, including Lee-Soo Man (founder of K-Pop power house SM Entertainment) who claimed that 1 million tracks consumed on MelOn do not cover the costs of making a music video for a single. The pressure resulted in government intervention and in January 2013 MelOn doubled its subscription rate to 6,000 won (about $5.60). Time will soon tell whether the increased revenue per user is cancelled out by the likely decline in number of users. Download collapse: MelOn’s price hike of course came after 2012 digital decline, which instead was caused by a collapse in music download revenue, dropping by a staggering 71% in 2012. The download collapse was the single biggest driver of the overall decline in revenue in 2012. In fact, if download revenue had remained flat, total revenues would have grown by 6% in 2012. Much of the decline is attributed to a tough year for another of SK Telecom’s properties, the social network Cyworld. Once the dominant Korean network, Cyworld enables users to buy music tracks to personalize their profiles but it has struggled to compete against Facebook and spent 2012 bleeding users. Physical longevity: physical revenues have bucked the global trend, with 2012 revenues 128% bigger than their 2006 low. This compares to a 14% rise for digital (though the 2012 collapse obviously skews the rate down). It is not a unique trend though, with Japan also experiencing a physical uptick in 2012. What links these two markets is the way in which the respective local pop sectors (K-Pop and J-Pop) have created ardently loyal fan bases that eagerly buy lavishly packaged CD products, often with merchandize extras, and frequently resulting in fans buying multiple editions of the same release. Thus for all the surge in digital, the South Korean and Japanese pop markets have found a way to deliver unique, tangible value with physical products. K-Pop: though the success of K-Pop has been key to South Korean market growth there is growing criticism of this highly manufactured genre. Artists complain of being ‘contract slaves’ while others point to the huge concentration of power in the K-Pop talent agencies. A cultural critique is that this industrialized pop methodology places too heavy an emphasis on presentation over content, and too strong a focus on ‘safe bet’ lowest common denominators. A clear echo of the American Idol and X-Factor phenomenon in the West. Whatever its issues though, there is no denying that K-Pop is central to the resurgence in South Korean music revenues. But perhaps most importantly of all, just like in the disclaimer of a financial services advert: music revenues can go up and down. Even when a market eventually starts to grow again, don’t expect that to mean that the corner has been permanently turned. To download a pdf report version of this blog post just click on the image. You can find more free reports to download here. Note: this post has been updated to reflect some clarifications provided by IFPI. Thank you to Gabi Lopes IFPI for the guidance. Changes are noted below. 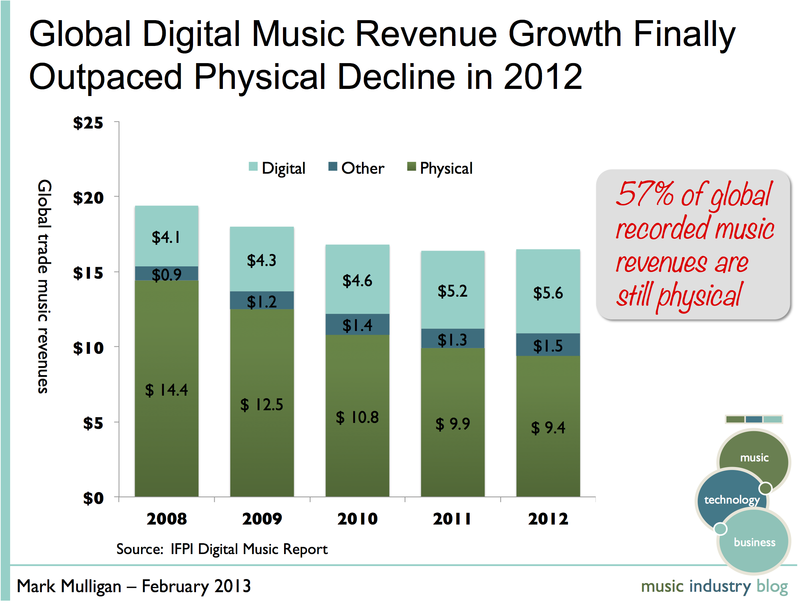 57% of music revenues still come from physical (see figure). With the exception of the US the few other markets that have surpassed the 50% digital mark (e.g. Sweden, India) are minor music markets in revenue terms. The simple fact is that the majority of music buyers still buy CDs. And to be clear, I said the majority of ‘music buyers’ still buy CDs, not the majority of ‘people’. So even forgetting for a moment the consumers lost to the music industry through piracy and other means, the majority of its core customers have still not seen reason enough to go 100% digital. And the interesting additional factor here is that the vast majority of people who are buying digital still buy some music on CD. So even among the vanguard of digital customers, the CD’s embrace is a lingering one. CD sales decline will likely accelerate. Among the top 10 largest music markets in the world CD revenue decline will likely accelerate markedly in the next few years. In France and the UK leading high street retailers are on their last legs while in Germany and Japan the vast majority (more than 70%) of sales are still physical. So the challenge for digital is can it grow as quickly as the CD in those markets will decline? But there is hope. Streaming services present meaningful opportunity and despite the fact 9.99 is far from a mainstream price point (it is in the entire monthly spend of the top 10% of music buyers) it is a great way to deliver disproportionately high revenue from a small base of consumers. If that model can be effectively transitioned to the mass market via more telco partnerships like Telia Sonera and Cricket then we may just have a mass-market digital music proposition on our hands. But while premium streaming offers future potential, it is expected to total no more than 10% of 2012 digital revenues. By contrast, Apple is the here and now. The IFPI reports that the total number of paid downloads for 2012 was 4.3 billion units. (The IFPI have clarified that albums are counted as single units are not counted as total number of tracks). Earlier this month Apple reported reaching the milestone of 25 billion songs sold, with the previous reported number being 16 billion in November 2011. Allowing for January 2013 being a particularly strong month (following all those Christmas iPad and iPhone sales) that gives an annual sales number of about 6.6 billion. This translates translates to $3.9 billion which is about 70% of all digital revenues. Which is still 2.3 billion more than the global total reported by the IFPI. The most likely explanation is that Apple’s February press release headline “iTunes Store Sets New Record with 25 Billion Songs Sold” was misleadingly incorrect – just as I suggested in fact at the end of this blog post – and that the actual numbers instead actually refer to ‘purchased and downloaded’ (i.e. a mix of the two). Apple remains the biggest and most important game in town. And even without Apple getting into the streaming game this is still good new for the music industry. As I posted a few weeks ago, Apple’s growth in iPad and iPhone sales has driven an upsurge in iTunes downloads, which coupled with iTunes’ expansion into multiple new emerging markets will bring even further digital growth. Finally, for some additional perspective, if you add Apple’s $2.6 billion to the $10.9 billion in CD sales, Apple and the CD combined accounted for 90% of music industry revenue in 2012. So for all the talk of streaming and new service innovation, in 2012 the CD and Apple remained the bedrock of music sales. The impact of technology on the music business is well understood, but it is also having a dramatic impact on the music buying population, which in turn is changing the face of mainstream music. Digital music has so far been a journey for the more engaged, technology savvy music fan. Some of these have discovered free music, others a la carte, others streaming. All of these behaviours have eaten away at sales of the music industry’s core product: the album. Yet the CD album remains the music industry’s number 1 global music product and in key markets like Japan and Germany it accounts for approximately three quarters of sales. The problem of course is that CD buyers are steadily falling out of the market (10.5 million people have stopped buying music entirely in the UK and US since 2008). Though re-releases and discounted catalogue sales have helped bump up volumes in some markets, the net result is that new release album sales are dwindling. Even more interestingly though, the abandonment of the album by engaged music fans is changing the face of the top 10 (see figure). Sales have tumbled sharply: the top 10 albums accounted for 56.4 million unit sales in 2000, by 2012 this had dropped by 38.7 million to 17.7 million (a 69% drop). Some genres have fared better than others: the average number of sales per top 10 album for Rock, Pop, and Urban all fell by 75% between 2000 and 2012. Country only fell by 66% and Adult by just 30%. Adult, with artists like Michael Bublé, Adele, Susan Boyle and Josh Groban represent the new ‘safe’ market for album sales. These artists appeal to older music buyers who still predominately buy CDs and often rely upon mainstream outlets like Walmart. Genres have fluctuated: although Pop is more pervasive than ever and now represents 41% of top 10 album sales, the sales for today’s Pop artists pale in comparison with those of the 2000 peak. One Direction’s 1.6 million and 1.3 million sales and Justin Bieber 1.3 million in 2012 compare miserably with ‘N Sync’s 9.9 million, Britney Spears’ 7.9 million and the Backstreet Boys’ 4.3 million in 2000. Urban has also steadily declined over the period, from a high of 50% of top 10 sales in 2005 to zero in 2012, while Country has steadily grown its share from zero in 2000 and 2001 to 19% in 2012. Rock, following a few strong years from 2006 to 2008 has been relegated to a niche of no more than 8% every year since, disappearing entirely in 2010. Of course the top 10 album sales are not the whole music market, but that is sort of the point: the top 10 is becoming ever less of a measure of broader music buyer tastes and even further from the tastes of more engaged music fans. Streaming and a la carte are empowering the music aficionados to deep dive, if not into the long tail, then certainly into the full torso of music, bypassing the short head of the top 10. Leaving the top 10 as the pulse of the dwindling mainstream. Is the UK the Canary in the Mine for Digital Music? It is beginning to look like we are at one of the most important junctures in the music industry’s history since the dawn of the digital age. Ever since the rise of Napster the music industry has navigated a number of tricky and outlook-defining decision points, such as: how to tackle piracy, whether to license to music services, whether to go DRM free, whether to support ad-supported, what to do with mobile? But now there is an even bigger question which straddles all of those sub-factors: Is Plan A working and if not, what is Plan B? It is easy to get the impression that the music market is moving towards being in a good place, that the corner is slowly being turned. 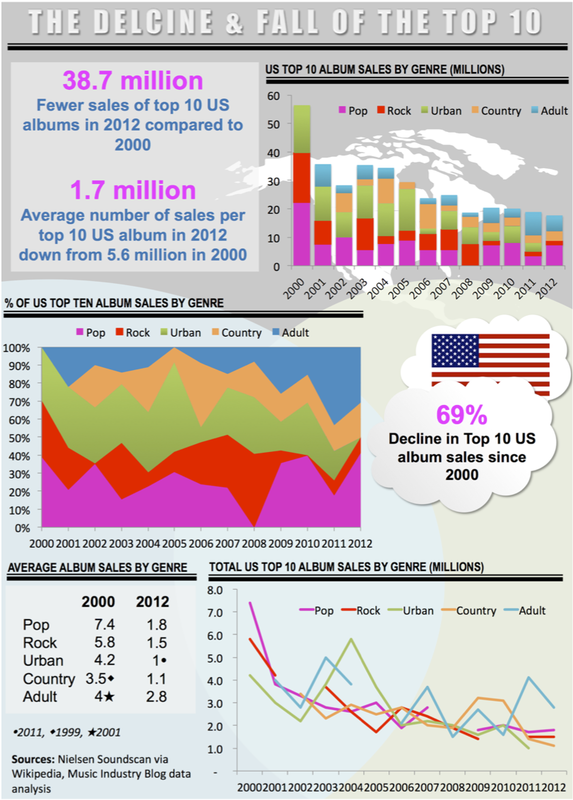 Indeed US sales, in volume terms at least, showed a modest upturn in 2011. However when the Adele factor is stripped out of the equation, music sales across most markets, US included, look a lot less rosy. But even leaving Adele in the mix, the UK – the world’s 4th largest music market – paints a concerning picture. To illustrate the point, let’s compare the situation now compared to 2 years ago. 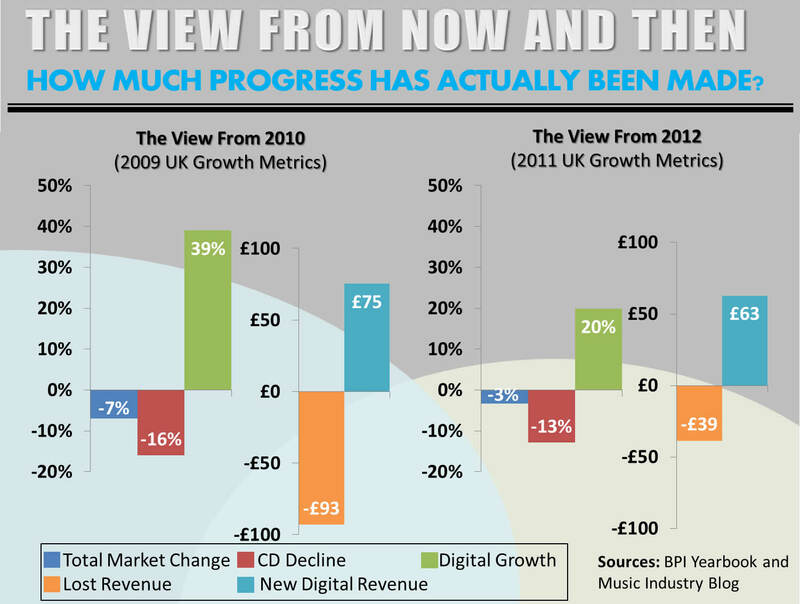 The view from 2010 (see chart) revealed full year 2009 trends of strong CD sales decline coupled with solid digital growth, but no enough to prevent overall market contraction. However the view from 2012 shows worryingly little progress. Though CD sales decline did slow, the overall market continued to shrink (also H1 2012 numbers show an acceleration in CD decline once again). Most concerning of all though was digital: growth slowed not just in percentage terms but also in absolute terms, down from £75 million new digital revenue in 2009 to £63 million in 2011. As a market grows it is expected that % growth slows too, but at this relatively early stage of the market’s development absolute growth should be continuing to grow too. The UK music market has spent most of the last decade in decline but if the current metrics and dynamics remain in place the UK recorded music market could end up losing a cumulative total of £1.3 billion between 2012 and 2017, more than its entire current value (see figure two). The good news is that digital will represent more than 70% of revenues, but that will be a larger slice of a much smaller pie. Digital buyer growth has slowed. Of the total UK digital music growth between 2008 and 2011, just 31% came from new buyers, the remainder came from increased spend per buyer. Increasing spend per buyer is of course an important strategic objective, but in these early days of digital music more of the growth should be coming from new customers, not from consolidation around the early adopter niche. With Apple’s iTunes accounting for such a large share of the UK and US digital music markets, it is unsurprising that digital growth is closely aligned with the rates at which Apple acquire new device customers (which, to be clear, is a very different metric from the rate at which they sell new devices) and the rate at which they grow average music spend. Music buyers are disappearing. 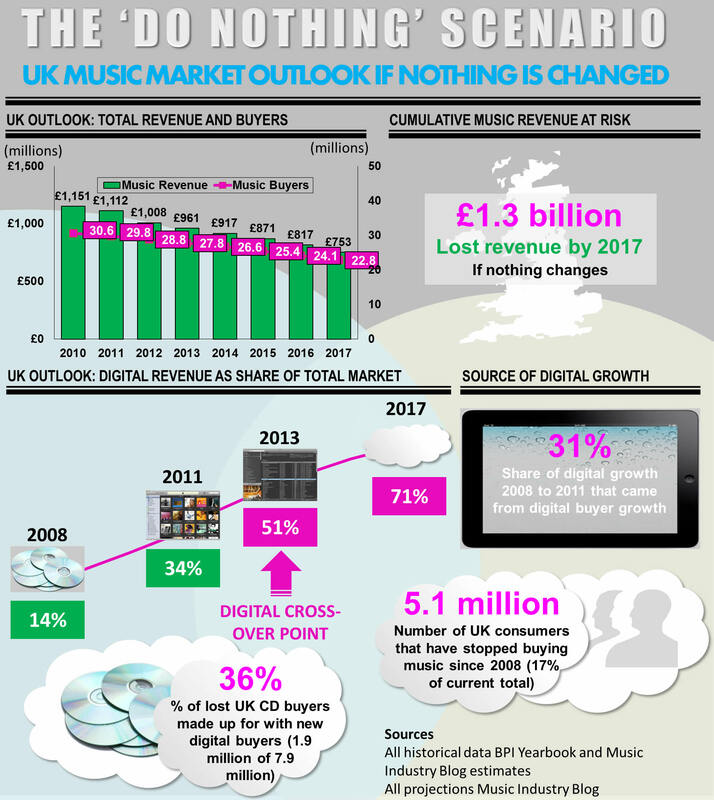 Extrapolating from Kantar’s UK music panel (as reported in the BPI Yearbook) approximately 5 million music buyers have disappeared from the UK market since 2008. Granted many of these buyers were probably low value customers and not all of them are necessarily lost for good, but it is clear that digital services are not doing a good enough job of converting music buyers from physical to digital and certainly nowhere near a good enough job of preventing lapsing CD buyers from disappearing out of the market all-together: against the total 7.9 million CD buyers ‘lost’ between 2008 and 2011, there were just 1.9 million new digital buyers. What Can Be Learned from the British Experience? The UK is not the same as the US, Japan, Germany, Sweden or any other music market. Nor is it a direct predictor of what will happen in each of those markets. However the overall direction of its market fundamentals are directionally similar – and in some cases functionally similar – to many other markets. The UK is not a failing music state like Greece or Spain, it is a robust market (by music industry standards) with a mature and established digital sector and – for now – an established high street retail presence. Over the last few years the UK’s story has been one of ‘steadying the ship’, of the corner slowly being turned. So the UK trends should be viewed in the context of how quickly a solid market can potentially veer off course. It is possible that the 2011 UK numbers will be followed by H2 upsurge in CD sales and an acceleration of digital growth, and I for one hope that this proves to be the case, but the safer bet is an evolution of the status quo. 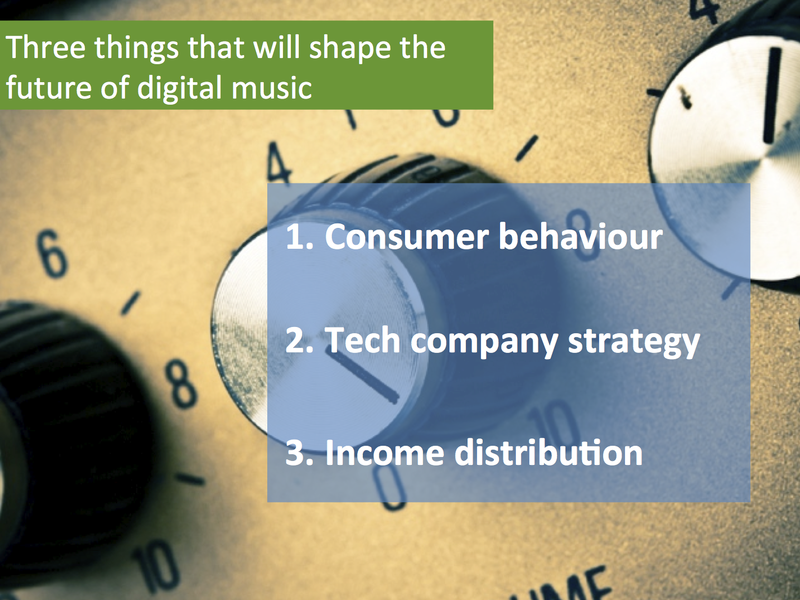 Across most key music markets it is clear that the current digital product mix is not delivering enough. The US has passed the 50% digital mark and in the case of this market it is the sign of robust market fundamentals. But passing the 50% mark in itself is not necessarily a measure of success. It is only a commendable achievement if it is not an artefact of a shrinking overall market (as was the case with South Korea when it crossed that point with much fanfare in the mid 2000’s). The UK’s music market is not about to implode, nor is the global market. But it would be wise to view the UK as the canary in the mine for global digital music strategy, to assess whether the air is truly safe to breathe, whether Plan A is up to task. Could the Distribution Crisis in the UK Drive Digital Growth? Hot on the heels of leading distributor EUK going into administration, Pinnacle follows, supplier of CDs, DVDs and games to the likes of HMV, Amazon and WHSmith. Could this squeeze on physical distribution be a boon for digital sales? The music retailers are certainly covering their bets: Zavvi announced the planned rapid launch of a new download store, HMV just revamped their store and Amazon’s sudden launch of their MP3 store makes more sense in the light of the Pinnacle problems. But unfortunately much of the Christmas present custom is more likely to shift to other media rather than to digital music. The download stores of the retailers will pick up some slack, but not enough to ‘save the day’. Physical distribution needs fixing, fast. What may benefit though, are Comes With Music handset sales. Mum out shopping for her teenage kids might just be swayed towards a 5310 instead of another handset if she was planning on buying some music as well. Ok, it’s tenuous. And that’s just the problem. When it comes to gifting consumers are pretty fickle customers: if they can’t find the CD they want they’ll get a book or DVD instead. So the most likely net result is accelerated overall decline rather than accelerated digital sales.